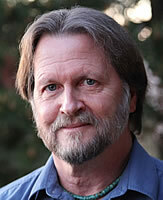 Christopher (Toby) McLeod has been the Project Director of Earth Island Institute's Sacred Land Film Project since 1984. He is currently working on a series about sacred places around the world, Standing on Sacred Ground (2013). McLeod produced The Four Corners: A Natural Sacrifice Area? with Randy Hayes, founder of Rainforest Action Network, and the late Glen Switkes, director of the film Amazonia. Their first film was the short, The Cracking of Glen Canyon Damn – with Edward Abbey and Earth First! McLeod has a master's degree in journalism from U.C. Berkeley and a B.A. in American History from Yale. USA, 1983, 58 min, English Production: Sacred Land Film Project The Four Corners: A National Sacrifice Area? Examines the cultural and environmental impasse of energy development in Arizona, New Mexico, Colorado and Utah. The film takes its title from a National Academy of Sciences report that concluded that strip-mining in the arid Colorado Plateau could permanently damage the land, creating a "national sacrifice area." Four Corners explores the hidden costs of uranium mining and milling, coal strip-mining and oil shale extraction in the "Golden Circle of National Parks" – the homeland of Hopi, Navajo and Mormon cultures.